We recommend checking out our discussion threads on the Sony VPL-SW235 WXGA 3LCD Short Throw Projector VPL-SW235, which address similar problems with connecting and setting up Multimedia Projectors Sony. The user manual for the Sony VPL-SW235 WXGA 3LCD Short Throw Projector VPL-SW235 provides necessary instructions for the proper use of the product A/V Presentation - Projectors - Multimedia Projectors. 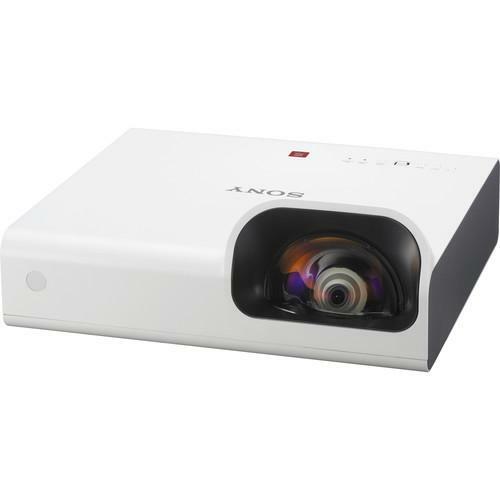 With a 0.46:1 throw ratio, the VPL-SW235 WXGA 3LCD Short Throw Projector from Sony is optimized for classroom and other installations where the projector will be mounted close to the screen. A single lamp provides 3000 ANSI lumens color brightness in Bright Mode, and a three-chip LCD imaging device renders a 1280 x 800 (WXGA) resolution, 16:10 "widescreen" aspect ratio image. Through scaling the projector can also support a range of non-native resolutions, up to Full HD (1920 x 1080) for video and UXGA (1600 x 1200) for computer sources. Multiple ports allow the VPL-SW235 to receive video and audio from a variety of sources, including computers, Blu-ray Disc and DVD players, document cameras, HDTV devices, and more. It features two VGA ports, an HDMI port, an S-video port, and a composite port. A VGA output mirrors the selected VGA input so that you can connect a computer monitor or pass the video along to a second downstream device without needing a distribution amplifier. There are also three analog audio inputs, two on 3.5mm mini jack connectors paired with the VGA inputs and one on stereo RCA that can service either the S-video or composite input. Audio can be output to amplified speakers or a sound system using a variable 3.5mm mini jack or using the projector's built-in 16-watt mono speaker. For giving "PC Free" presentations, there is a USB type A male port that accepts FAT32-formatted media and supports a variety of still image formats. This port also allows you to install the optional IFU-WLM3 Wi-Fi module, available separately. A USB type B female port gives you another way of connecting the projector to computer, especially when an HDMI or VGA output is unavailable. If you own a Sony multimedia projectors and have a user manual in electronic form, you can upload it to this website using the link on the right side of the screen. The lamp contains mercury. Disposal may be regulated due to environmental considerations. For disposal or recycling information, please contact your local authorities. Box Dimensions (LxWxH) 17.4 x 15.6 x 9.8"
The user manual for the Sony VPL-SW235 WXGA 3LCD Short Throw Projector VPL-SW235 can be downloaded in .pdf format if it did not come with your new multimedia projectors, although the seller is required to supply one. It is also quite common that customers throw out the user manual with the box, or put the CD away somewhere and then can’t find it. That’s why we and other Sony users keep a unique electronic library for Sony multimedia projectorss, where you can use our link to download the user manual for the Sony VPL-SW235 WXGA 3LCD Short Throw Projector VPL-SW235. The user manual lists all of the functions of the Sony VPL-SW235 WXGA 3LCD Short Throw Projector VPL-SW235, all the basic and advanced features and tells you how to use the multimedia projectors. The manual also provides troubleshooting for common problems. Even greater detail is provided by the service manual, which is not typically shipped with the product, but which can often be downloaded from Sony service. If you want to help expand our database, you can upload a link to this website to download a user manual or service manual, ideally in .pdf format. These pages are created by you – users of the Sony VPL-SW235 WXGA 3LCD Short Throw Projector VPL-SW235. User manuals are also available on the Sony website under A/V Presentation - Projectors - Multimedia Projectors.